Offering up relaxed and easy beachwear with bold, Latin American influences, the Maaji label is one to look for where days under the rays are concerned. Crafted in Colombia, the Maaji label injects each of its lines with bold, tropical prints and a feminine sensibility. 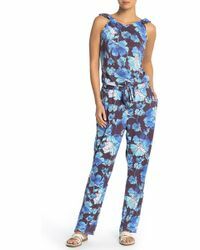 Take this edit of jumpsuits and rompers as an example of the Maaji signature style, infused with floral prints and distinct cross-back details that make your summer look stand out.